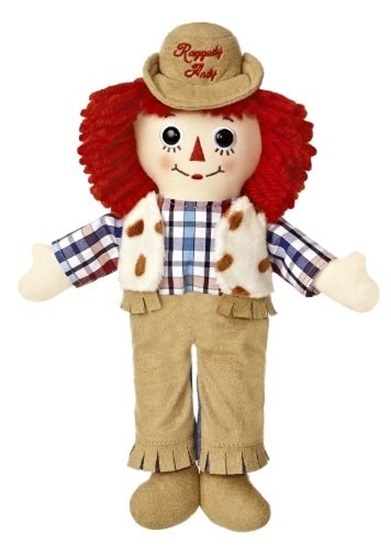 The 12 inch Raggedy Andy doll is by Aurora Gift Co. who holds the license. This 12 inch Raggedy Andy doll from the Aurora doll company, who now holds the license for the Raggedies, will lassoo his way into your heart. He has the classic looped red yarn hair, stitched facial features, including the classic red triangle nose, plastic button eyes, stitched eyebrows, eyelashes, and mouth. And yes, he has the embroidered red heart on his chest with the words "I Love You" inside it. He is wearing western wear with faux suede, fringe, denim, lots of details and a high pile patterned vest. A faux suede cowboy hat with "Raggedy Andy" stitched in red cursive lettering sits atop his head.